Make your guests stars of their own movies with the Boomerang Booth! The Boomerang Booth is Looping Fun! Viral Booth's Boomerang Booth is an exciting, easy to use experience takes a burst of 15-20 photos in 3 seconds. Then, it turns them into a hilarious looping video. Boomerangs appear instantly so guests can text, email and share them on social media. Add a green screen to immerse your guests in your theme and/or unlimited prints as a great souvenir! The Boomerang Booth is the smallest of our photo booths, taking up only 1 ft x 1 ft of space. The booth rental includes all of these features. Or, we can customize a package for you. 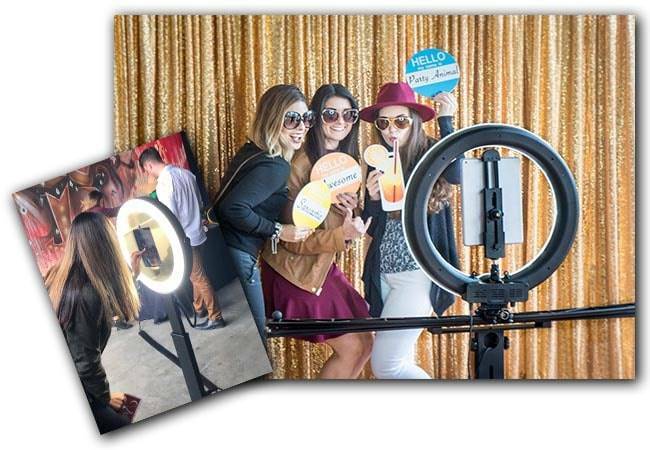 The Boomerang Booth is a fun and interactive addition to weddings and parties and leaves your guests with amazing keepsakes from your celebration. Adding a custom overlay to your photos and Boomerangs is a great way to make your booth match your theme. Ask us about overlay options when you request prices.